Please do not game the Too Many Requests ... if you do the next time will be even longer until you can't access that route for quite some time as well as script installation will fail until the calculated expiration. @@||openuserjs.org/scripts/*/*/*$document... unblocks the script navigation bar. @@||openuserjs.org/src/scripts/*/*.user.js$xmlhttprequest... unblocks the .meta.js indirect AJAX requests. @@||openuserjs.org/src/scripts/*/*.meta.js$xmlhttprequest... unblocks the .meta.js direct AJAX requests. @@||openuserjs.org/meta/*/*.meta.js$xmlhttprequest... unblocks the .meta.js direct AJAX requests. @@||openuserjs.org/meta/*/*.meta.json$xmlhttprequest... unblocks the .meta.json direct AJAX requests. ... possibly more depending on the settings at any given time. 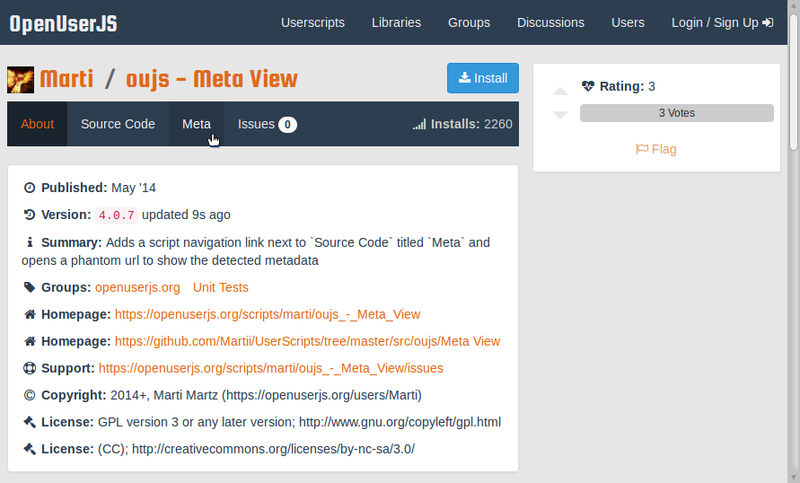 See this FAQ for a detailed explanation of all supported meta methods. Use this compatibility matrix to determine if this script is right for your system. Find the platform on the top and find your browser on the left. Where they intersect is the compatibility. Firefox 57+ is quite crippled and currently there may be limited support for GM4. This script is designed primarily as a Unit Test to check to see if the production server is returning the metadata blocks only, instead of full script source, on a specific headered request exactly like most .user.js engines do for update checks. It still offers some functionality in case you want to view the stored metadata blocks that are collected by OUJS.